This week I want say happy Birthday to Angela Davis and Anita Baker, and talk specifically about settling in. I've written about Detroit more broadly and some of my experiences in it as well as some history, and I'd like to focus more on my experience growing into the house I call the Brave New Home. Recently, I was asked by an interviewer if I was "psyched out" by the stability that having a home brings. He framed the question around the notion that most writers are not afforded the kind of stability that I have been granted through Write A House. While I am well aware that most people who attempt making a living from their art don't necessarily have a steady income streams, or own their homes, I think it's silly to attribute these realities exclusively to writers. Another interviewer exclaimed that I was a prime example "starving artist". I don't know where she got that idea, because we were sitting across the table from each other, which should have made it evident that I am well fed. I pull out these two particular moments because I think there's something dangerous about the assumption that writers, artists, and other creative types who lives typically subject to pain, suffering, financial woes, and struggle. While this may well be the case for many people who are trying to "make it" as artists in their field, it's not as if that condition is particular to creatives, especially in Detroit, where a disproportionate number of people are struggling with money, struggling with trying to keep a roof over their heads, struggling to keep their water turned on. In my childhood I watched my dad worked tirelessly as a produce man, and he was always proud of his work. He would take on multiple jobs just to make sure that there is food on the table and a roof over our heads. My mom also worked on and off as well. Sometimes there were layoffs, sometimes we struggled, particularly after Dad was diagnosed with kidney disease. He had donated one of his kidneys to his brother Stephen in 1987. Doctors had told him that there was no chance of him developing kidney disease later in life, because it was not hereditary. Unfortunately, the kidney did not take, and my uncle continued to live with his illness until 1996, when he committed suicide. My parents bought their first home that same year, but nothing felt particularly stable. It wasn’t until my dad received a kidney transplant in 2002 that it even seemed like security was possible. It was short lived. A month after the transplant, my dad died of a heart attack in his sleep. The concept of stability seems like a farce to me. This is not to say that I don’t believe in security, or don’t actively seek it, but that I am painfully conscious of how unpredictable and temporary life is. Even now, my mom lives alone in the house they bought in ‘96 today, continually under threat of foreclosure. I have never lived with my biological father, but we’ve had a relationship my whole life, and his current situation is just as tenuous as my mom’s. He and his ex-wife ran a successful property management company in Baltimore that went under around 2008. He’s also facing near certain foreclosure, which impacts not just him, but also my youngest brother, who turned 13 this past week. Most of the furniture in my house came from his home in suburban Maryland. Two days before I came to Detroit, my friend Erich and I picked up the rental truck and drove to his house, where I went on a “shopping spree”, picking out furniture and other assorted items from what he had not already sold or given away in preparation of the impending move. I say all of this to acknowledge that I am not simply lucky for a writer, but that at 29 I am the only person in my immediate family who is not renting or facing foreclosure. This is daunting and terrible and complicated, and also impossibly significant. Being granted this opportunity has given me so much to be grateful for, and making this Write A House into a home has been a very deliberate labor or love. Well before I moved in, so much labor, care and generosity were put into it, and I wake up every day still floored that this is really where I am, that so many people are invested in such a truly wild idea, that so many people were invested in bringing me here. Decorating has been gradual. I just finished painting the interior of the house last week. For whatever reason, determination, stubbornness, or folly, I did all of the painting alone. It was relaxing. I listened to a wide range of music. As I was painting, everything else just sort of fell away. Music has always played a huge role in my life; it has influenced my writing and saved me from despair as much as literature has. In the sweaty, nostalgic haze of painting and moving furniture around, I spent a lot of time reflecting upon the music that influenced me as a teenager in particular. In my early teenage years I listened to punk almost exclusively. It suited me because it was angry, loud, fast and flippant, but there were very few punk rockers who I could identify with. I thought about when I first laid eyes on Poly Styrene, a moment which blew my mind. She was fourteen when the X Ray Spex gained notoriety, she had the strangest and most punk singing voice I’d ever heard, and to top it off, she looked like me. Looking back on it, encountering the X Ray Spex was so formative for me because I think it may have been the first time I realized the importance of visibility—the importance of seeing someone who shares identity markers with you doing something that you admire, creating something that speaks to you. From there, my mind began to drift towards thinking about place as crucial part of defining one’s identity, and how important the sound of a city is to defining it. Growing up in Massachusetts I had the misfortune of having the place I came from associated with New Kids on the Block and “More Than a Feeling”, a song that to this day fills me with unspeakable rage. The only major Massachusetts act I felt any deep sense of investment in was The Pixies. On a side note, Frank Black’s brother owns The Quarterdeck, the best bar in my hometown. As I was thinking about it, I realized that Detroit’s musicians have shaped my interior landscape long before I had ever been here. It’s an incomplete list, but shout out to Aaliyah, J Dilla, Derek May, Angel Haze, Danny Brown, Eminem, all of Motown, the Stooges, Rodriguez, MC5, Black Milk, & Bob Seger. While all of these musicians have influenced me, I don’t think any story in music fascinates me more than that of the band Death. If you haven’t watched the documentary A Band Called Death yet, stop reading this and go watch it right now. I’ll wait. As I was painting the living room, I began to paint a small section of a wall sky blue without really thinking. Later that night, I started to fill in clouds, which then took on the shape of a pyramid. 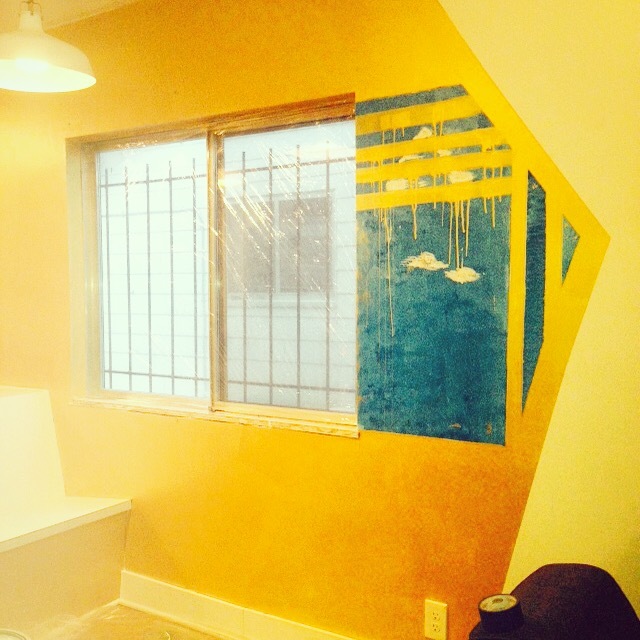 I was painting over the span of a few weeks, but I kept coming back to that one section of the wall. Eventually it became an artwork unto itself. I call it “Politicians in My Eyes” and it’s my homage to Death, and it’s one of the things that anchors me, that makes me feel most at home. Beyond being a tribute to an incredible band, it also serves as a daily reminder of finding profound magic in the mundane and the importance of creating work you care about whether or not other people fully embrace it, or you. For me, this is vital, especially as I begin to accept the idea that I can just be a writer here. So much of my journey towards belonging is paved with a burgeoning sense of self-acceptance that allows me to be patient with myself. For two years in my mid-twenties, I didn’t write a single poem because some of my poems had greatly upset people I cared about. Beyond that, I would beat myself up over the idea that nothing I did had ensured the financial security of everyone I love. In Brooklyn, I started to shake these impossible expectations. If I hadn’t, I don’t know that I would ever have applied to Write A House to begin with. Even in the short time I’ve been here, living in Detroit has given me a sense of freedom and possibility unlike any I’ve ever felt, and I’m thrilled with the possibilities of all that I can make in this Brave New Home.